With rising cost of professional courses and increasing acceptance of loans, Education loan has become quite popular among students and their parents. Other than giving an opportunity for better education, it also gives you tax deduction under sec 80E of Indian Income Tax Act once you start earning. 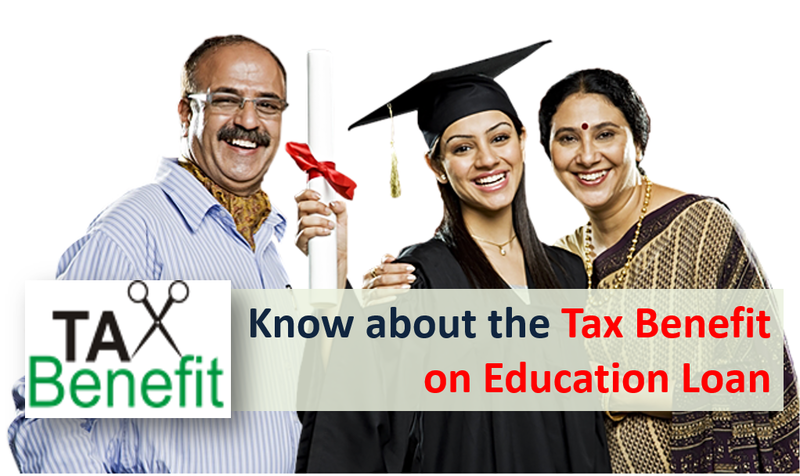 This post covers all the questions you might have regarding tax benefit on education loan. How much tax benefit is available on Education Loan? As for any EMI, the EMI that you pay for education loan has two components – interest and principal. The tax benefit on education loan is available only on the interest component. You are eligible to deduct the entire interest paid (without any limit unlike in case of Housing loan) in the financial year from your income of that year. There is no deduction on principal paid for Education Loan. Suppose you have an education loan of Rs 5 Lakh at 11% interest rate per annum. Your repayment tenure is 5 years. So your EMI would be Rs 10,871. * Assuming you are in 20% tax bracket. Who is eligible for Education Loan Tax Benefit? Anyone who has taken education loan for self, spouse or children, is eligible to claim tax deduction. What kinds of courses are eligible? As per the Income tax rules, the education loan should be for regular or professional courses pursued after passing the senior secondary examination. The course should necessarily be full time. You are eligible for tax deduction for above courses irrespective of it being pursued in India or abroad. The education loan should only be taken from approved charitable trust or a financial institution. In case you have taken loan from your relatives, friends or employer that amount would not qualify. Only person on whose name the loan is taken can claim the tax benefit. In case its a joint loan, either of borrower can claim. Hello sir,. I am planning to take education loan for my son . My question is if I pay only interest amount from my account during the 5 yr b-tech course, and the principal amount my son will pay when he get job..then can I claim deduction of only interest amount of these 5 years??? Sir, I have paid Rs. 22000/- as a interest on education loan of my daughter. How this amount will be deducted from my income. The education loan interest would be deducted under section 80E, which is in addition to 80C (1.5 lakh limit). So in your case the tax exemption under section VI would be 1,72,000. I take Education loan 2013 but a I am not paying any priciple & interest, I am settled single payment Interest & principle in 2017-18 FY. But conflicting point here is again its written that entire interest can be claimed unlike home loan interest. Can you give calrification on this point. The table actually says amount saved assuming 20% tax bracket. I think I will remove this column as it might create confusion. For education loan entire interest is deductible for taxable income. I want to take education home for my son in next month. If opt pay interest per year during study period (b tech in NIT 2017-2021), can I avail tax benefit under 80 E w.e.f financial year 2017-18 and till what year. please suggest me. I am repaying my education loan for last 5 years, so can I take last 5 years interest for tax exemption? This year I am going to pay IT first time . You can claim tax exemption on education loan for the interest paid in the relevant financial year only – not on the previous years payments. Can we take the exemption of interest for self study during we do job and take higher study with correspondence. Tax on Education loan is only applicable for full-time courses. What documents are required to be submitted in support of the education loan interest payment? Can I use the e-Bank Statement ? I am using INB to pay the EMI. Can we also avail loans for part time courses ? Is a working professional eligible for education loan ? You can get loan but not tax benefit on loans for part time courses! Higher education means any course of study pursued after passing the Senior Secondary Examination or its equivalent from any school, board or university recognised by the Central Government or State Government or local authority or by any other authority authorised by the Central Government or State Government or local authority to do. to claim deduction the course has to be authorized by central or state govt but you said that the loan taken could be utilized for course in India or ABROAD????? There are several courses abroad which are authorized by Indian Govt. For e.g. if you do graduate from US you are considered equivalent to graduate in India. So recognition here refers to the above instances.